The Zatelliitti industrial area is favourably located by the motorway between Zeppelin and the centre of Kempele municipality. At present, the Zatelliitti area can only be accessed through Ketolanperäntie. The accessibility of the area, currently with only one entry from the main roads, has caused some problems, in particular, rush-hours tend to slow down the traffic considerably. According to the feedback received from several potential businesses during the marketing of the industrial sites, the main obstacles for settling down in Zatelliitti were the dead-end location of the area and the lack of a direct entry from road 847. To improve the operational preconditions for businesses, revisions have been made to the land use plan of the Zatelliitti area. 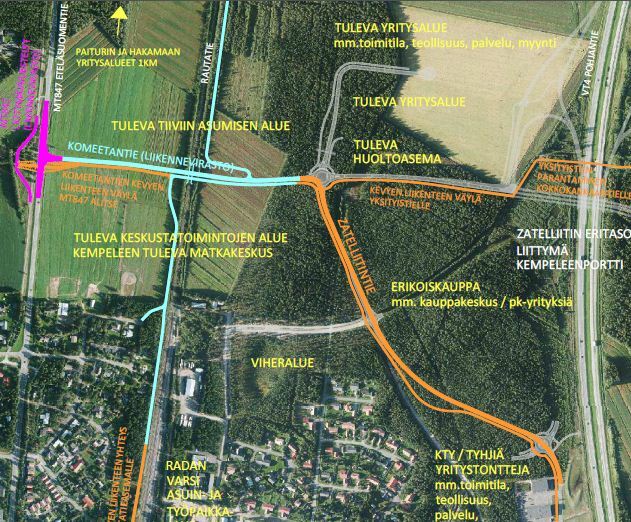 A new land use plan concerning traffic arrangements has already been confirmed for Zatelliitti, while the plan for additional industrial sites is still in its draft phase. The municipality is currently working together with the Finnish Transport Agency to set up an improved access to Zatelliitti from road 847. The main goal of this endeavour is to improve the accessibility and to boost the attractiveness of the Zatelliitti industrial area. The appeal of the area is likely to grow through the improved accessibility and entry arrangements. This will not only offer a favourable location for now businesses, but also boost the sales of the businesses already existing in the area. As a result of the more successful operation and new enterprises emerging in the Zatelliitti area, more jobs will be created, which will reflect as increased employment opportunities and welfare in and around Kempele. In terms of numbers, the goal is to attract 25 new businesses into the area, offering roughly 400 new jobs in different industrial enterprises. The improved traffic and logistics arrangements in the area are likely to bring about growth in industrial and business activities, which will create more employment opportunities. As a long-term consequence, the estimated total value of the industrial investments in industrial constructions amounts to approximately EUR 95 million.